A quiet, charming, simple & relaxing - casual 3 bedroom coastal cottage. Scenic surroundings with expansive water views over lake, beach, sandbar and ocean. Living & dining area opens onto large entertainment deck. An easy stroll to Smiths Lake waterfront and short drive to a selection of superb beaches. Private and set back from the road - a place to escape and be nourished by nature. 3 X BEDROOMS: 2 double bedrooms with queen size beds - main one with superb water views and reverse cycle A/C. Plus one bedroom with a tri-bunk (1 x double and 1 x single). KITCHEN: Open plan kitchen with breakfast bar. Fully equipped and includes microwave and dishwasher. LIVING: Open plan lounge/dining and opens onto sea view deck. Wood fire burner for cozy wintery holidays. Includes all mod cons; large flat screen TV, DVD, Video and CD, iPod/ iPhone docker and free wifi. DECK: Large entertainment deck with spectacular lake, beach & ocean views - gas barbecue - enjoy relaxing sunny breakfasts and dinners under the stars with a vino and freshly caught local seafood. SUN-ROOM: Small sun-room/kids den off the living area is perfect as a study or for playing computer games. Includes and an additional small TV and DVD player. BATHROOMS: Newly renovated main bathroom, with WC. Under-floor heating for winter with separate shower and bath. 2nd. WC - combined with laundry with washing machine & dryer. PHONE: Not provided, however Telstra reception is excellent for both mobile and mobile broadband. PARKING: Off road parking - but not undercover. Stroll down to the waterfront, or 2 min. by car - for a swim, fishing, or a coffee. Smiths Lakes a large, beautiful lake - perfect for safe swimming, windsurfing, kayaking, catamarans, boating or fishing. SANDBAR (or CELLITO) BEACH: Just a short drive away, and entered by walking through a rainforest - or a short hop across the lake by water - for a swim, a fish or a picnic. It's a stunning beach - great for swimming, surfing, fishing, and long beach walks. BLUEYS and BOOMERANG BEACHES: A few minutes drive further north, are 2 popular, surfing, swimming and fishing beaches. ELIZABETH BEACH: A safe family beach - for swimming & fishing. SEAL ROCKS: is an easy drive to the south - and has a number of beaches - providing great surfing and fishing beaches, plus excellent for diving & sea kayaking - magnificent views from the lighthouse. Apart from Smiths Lake, there are many other nearby lakes and waterways providing excellent fishing, boating, windsurfing and kayaking. Prawning is very popular when in season. 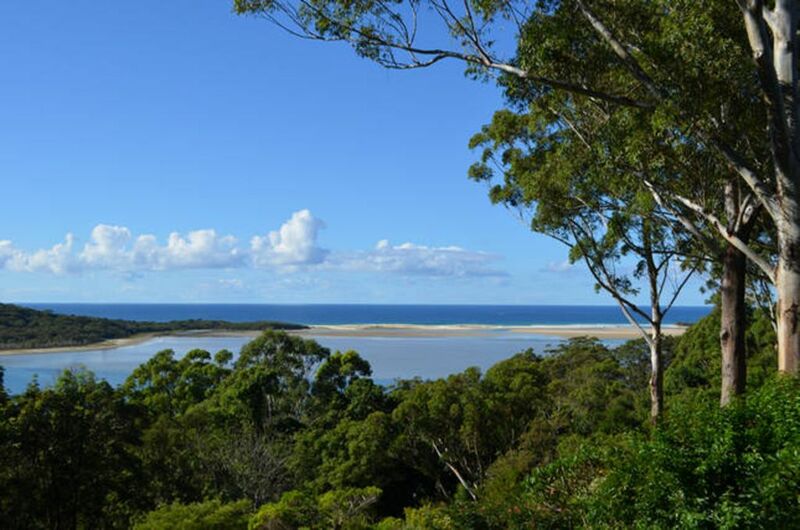 The area features many National Parks and sub-tropical rainforests with bush and coastal walking trails. There are 2 local clubs, a couple of restaurants and coffee shops within minutes of Smiths Lake and the Palms beaches. Both Smith Lake and & Blueys Beach have takeaway. In Forster, 20 minutes north, there are a number of clubs, a variety of restaurants. Or you can share your fresh caught fish & chips with the seagulls on the Co-Op wharf at Tuncurry. The famous ‘Froffy Coffee’ restaurant/boatshed is great for that early morning breakfast and lunch. Situated, on top of the water in a boat shed next to a beautiful beach for children to play. Under 5 minute walk from Seaward. PS – You can also hire canoes, kayak, sailing & fishing boats. Seal Rocks - Famous national parks, beaches and beautiful walk to the lighthouse. Bluey Beach – Next beaches, located 7 minutes from Seaward, Boomerang & Elizabeth beach. The best and most beautiful is the famous Sand bar/Celeto beach seen from the house and which you can take four wheel drives along the beach. Smith Lakes – Great from swimming boating and fishing. Myall and Wallace Lakes which take you all the way from Seaward to Forster via water. In short Seaward is surrounded by 3 magnificent lake systems thus the area known as ‘The Great Lakes District’. We stayed one week in July and we loved each hour of our stay! The house is perfect, comfortable and very well equiped, and we loved the bottle of wine left there by the owners to welcome us when we arrived! The view is absolutely astonishing, even more beautiful than what you can see on the pictures... It is a little heaven: you are surrounded by trees and birds and the only sound that you can hear, apart from the birds, comes from the ocean waves... Thank you for these great holidays, the kids and us loved it!Judith and Eric, Gabrielle and Paolo. We had a fantastic time. Bill and Britt are gracious and generous hosts, their house is lovely and Smiths Lake is beautiful. We didn't want to go home!! I would recommend a stay at Seaward without hesitation. We stayed at Seaward during the Easter weekend and had a wonderful time. The house has superb views, is in very good condition, nicely decorated with a lot of taste. All you need is there, you just have to sit down, relax and enjoy. Would go again for sure. We enjoyed a wonderfully relaxing week at Seaward. The house has a sensational view, the natural light and gentle breeze made it very comfortable at all times. The house was presented immaculately and was fully equipped - kitchen had everything, big bbq on the huge deck with plenty of lounges, chairs etc, outdoor shower. Superb location - 100m from local shops (butcher, bottleshop, cafe, mini-store) and was very quiet (could only hear the sounds of the ocean and the birds). This is the house for guys who like to be close to great surf and for girls who want to have some luxury!!!! What an amazing place, we instantly felt relaxed and at home as soon as we arrived. The views are fantastic and the property is very quiet and private. All modern conveniences are available and every detail was considered. The bottle of wine was an added bonus. The house is close to shops, lakes and beaches. We can't wait to come back to this special place!